James Dolan hires Isiah Thomas as president of the Liberty. The NBA should suspend James Dolan. The Knicks owner just hired sexual harasser Isiah Thomas as president of a WNBA team. Will the NBA do the right thing? 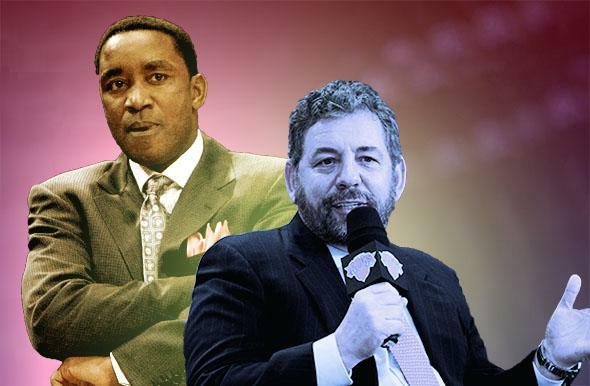 The NBA this week has seen the blundering insensitivity and arrogance of New York Knicks owner James Dolan (right) and his longtime ally, former Detroit Pistons star Isiah Thomas. Photo illustration by Slate. Photos by Nick Laham/Getty Images and Maddie Meyer/Getty Images. About a year ago, a tape of Los Angeles Clippers owner Donald Sterling disparaging black NBA fans became public. The tape was a sensation for a number of reasons—it was recorded by the aged multimillionaire’s young and eccentric female companion, it was released in the midst of a Clippers playoff series, it was somehow provoked by one of the least racially divisive NBA figures in history (Magic Johnson), and it was filled with compellingly dazed nonsense-babble articulating a totally offensive worldview. It was an unavoidably viral, unambiguous instance of racism in a country that usually has a lot of trouble agreeing on what constitutes a legitimate racial grievance. As it happens, the NBA has this week been given the chance to demonstrate that its decisions regarding league figures’ conduct are motivated by principles of decency rather than headlines and PR opportunism. That chance has been provided by the blundering insensitivity and arrogance of New York Knicks owner James Dolan and his longtime ally, former Detroit Pistons star Isiah Thomas. In 2007, a jury found that Thomas, at the time employed as the Knicks’ coach and team president, had sexually harassed a Knicks executive (and accomplished former basketball player) named Anucha Browne Sanders. Browne Sanders had been terminated after complaining internally about Thomas, and the jury awarded her $11.6 million in punitive damages for the harassment and her firing. Dolan and the Madison Square Garden Company, which owns the Knicks and is controlled by Dolan, were found culpable in Browne Sanders’ mistreatment for firing her. MSG did not appeal the jury’s decision and subsequently settled its legal dispute with Browne Sanders for $11.5 million ahead of a scheduled hearing regarding compensatory damages. Thomas was relieved of his duties in 2008. We did not believe the allegations then, and we don’t believe them now. We feel strongly that the jury improperly and unfairly held Isiah Thomas responsible for sordid allegations that were completely unrelated to him, and for which MSG bore responsibility. In fact, when given the opportunity, the jury did not find Isiah liable for punitive damages, confirming he did not act maliciously or in bad faith. We believe Isiah belongs in basketball, and are grateful that he has committed his considerable talent to help the Liberty succeed. The statement is as astoundingly arrogant (Madison Square Garden is quite skeptical of this “trial by jury” concept!) as it is misleading. As one of Browne Sanders’ lawyers pointed out on Twitter, the jury in fact explicitly found Thomas at fault. The Dolan-Thomas story doesn’t have the sensational dimensions of Sterling’s case—there’s no Hollywood mistress and no secretly recorded tape. What it does have is the sad, sleazy certainty of legally determined facts: Isiah Thomas sexually harassed Anucha Browne Sanders and was abetted by James Dolan and the Madison Square Garden organization. Dolan has now once again insulted Browne Sanders, Madison Square Garden’s other employees, and NBA and WNBA fans by rehiring Thomas. To protect the league’s integrity, and to uphold the principles it correctly asserted in punishing Donald Sterling, Adam Silver should suspend James Dolan from all personal and professional involvement with the WNBA and NBA.